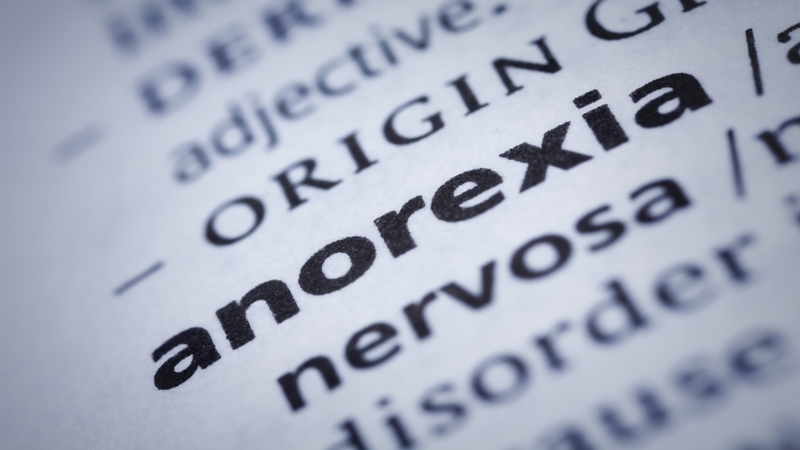 Anorexia nervosa is a serious, chronic, and life-threatening eating disorder defined by a refusal to maintain a healthy diet because of the fear of gaining weight. Other symptoms are, intense fear of a distorted body image, and amenorrhea (absence of at least three consecutive menstrual cycles). In addition to the classic pattern of restrictive eating, some people will also engage in recurrent binge eating and purging episodes. Starvation, weight loss, and related medical complications are quite serious, and can also result in death. People who have an ongoing preoccupation with food and weight, even when they are thin, would benefit from visiting a therapist. The term anorexia literally means loss of appetite, but this is a misnomer. In fact, people suffering from the disorder ignore hunger, and thus control their desire to eat. This desire is frequently suppressed by cooking for others, or by hiding food that they were supposed to eat. Obsessive exercise may accompany the behavior, causing the others to presume that the person is healthy. Like all eating disorders, anorexia nervosa tends to occur during puberty, but can be triggered at any age. It predominantly affects adolescent girls and adult women, although there have been cases in men and older women too. One reason younger women are particularly vulnerable to eating disorders is their tendency to go on strict diets to achieve an "ideal" figure. This obsessive behavior reflects today's peer pressure to be thin, which is glorified through advertising and media. Others at risk for eating disorders include actors, dancers, models, and TV personalities for whom thinness has become a professional requirement. For the person with the disorder, the satisfaction of control achieved over weight and food becomes very important, even if the rest of their life is chaotic and emotionally painful. People with anorexia nervosa usually lose weight by reducing their total food intake and exercising excessively. Many persons with this disorder restrict their intake to fewer than 1,000 calories per day. Most avoid fattening, high-calorie foods, and eliminate meat from their diets. The popular food items with the affected people are low-calorie vegetables like lettuce and carrots. One of the most frightening aspects of this disorder is that people affected with it continue to think they look fat, even though they may be bone thin. Their nails and hair become brittle, and their skin may become dry and devoid of color. Depression is common in patients suffering from this disorder. Affected people often complain of feeling cold because their body temperature drops. They may develop lanugo (a term used to describe the fine hair on a newborn) on their body. Other psychiatric disorders can occur together with it, such as depression and obsessive compulsive disorder. Remember, food is great, and can never harm you unless you lead a sedentary lifestyle and overeat.